We recently spent a long weekend visiting Philadelphia, Pennsylvania for the first time and I’ll be covering our experiences in a series of four blog posts. I am starting with our stay at The Logan Hotel and pairing the review with a recipe for the iconic Cannoli. 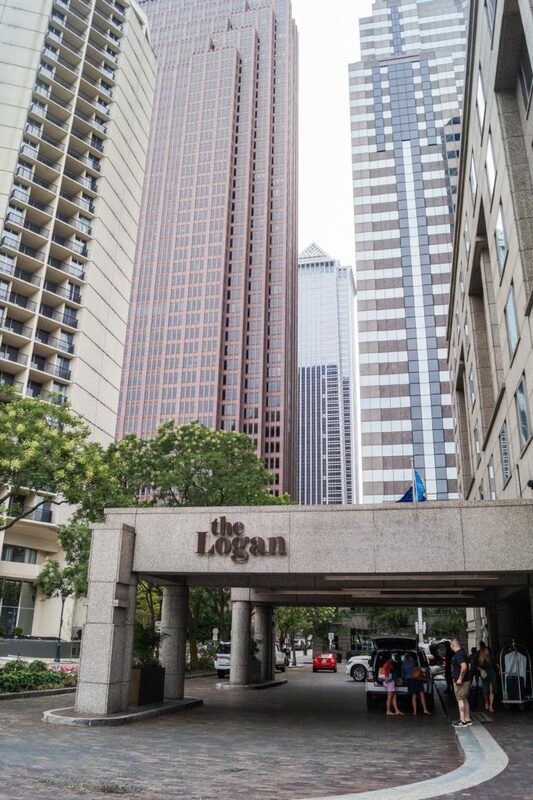 Disclosure: I received a two night stay at the The Logan Hotel in exchange for my honest review. All comments and opinions are my own. Prices listed are for the time of this post (August 2017), subject to change. This post contains Amazon affiliate links. If you purchase something through the link, I may receive a small commission at no extra charge to you. 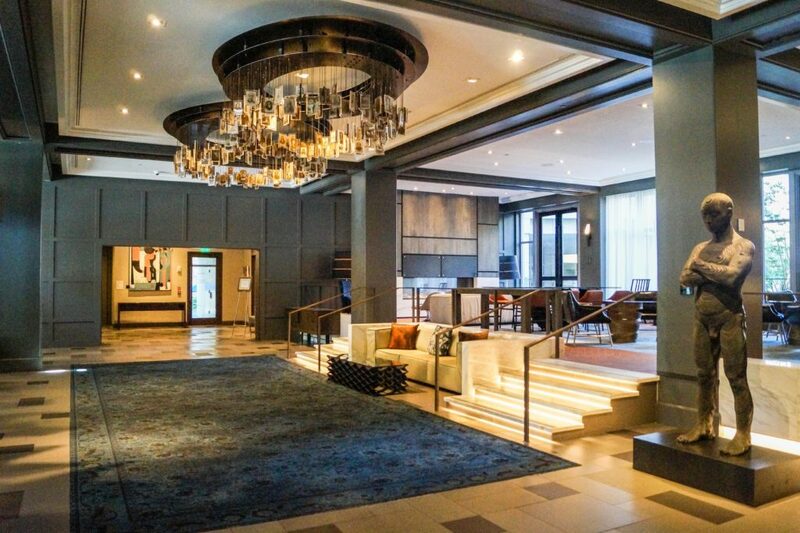 The Logan Hotel, named after James Logan (a colonial secretary to William Penn, Mayor of Philadelphia, chief justice of the PA Supreme Court, lieutenant governor and acting governor, and a founding trustee of the College of Philadelphia), is a part of CURIO, a collection by Hilton. 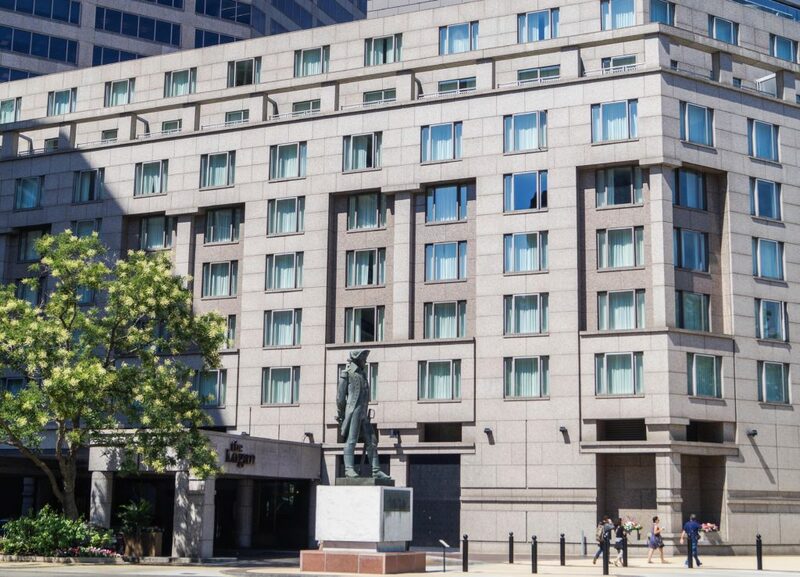 It opened in 2015, taking over the building previously occupied by the Four Seasons, and sits at the northeast corner of North 18th Street and the Benjamin Franklin Parkway in the Center City of Philadelphia. The location couldn’t have been better for a family vacation to Philadelphia. It is next door to the Academy of Natural Sciences of Drexel University and a short walk to The Franklin Institute. The Philadelphia Museum of Arts, Chinatown, Reading Terminal Market, and Rittenhouse Square are all within a mile. Independence Hall is about 1.5 miles away and the Delaware River waterfront is a bit further at a little over 2 miles. We left Northern Virginia around 6 am on Saturday morning to avoid the beach traffic that often hits I-95 during the summer weekends in our area. It was an easy drive and took about 3 hours. With our kids and luggage in tow, we took advantage of the hotel’s valet parking with in and out access for 55 dollars per night (allow 10 minutes for car retrieval). 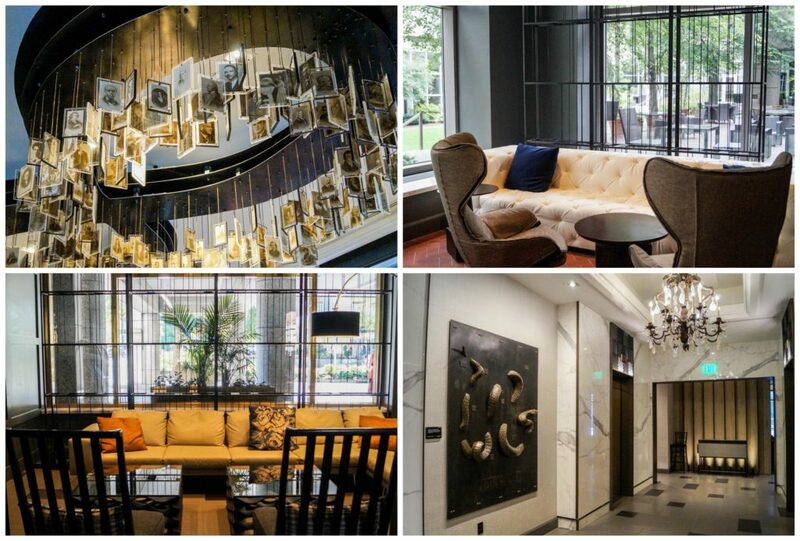 Upon walking into The Logan, we were greeted with an urban-style interior mixed with historical inspiration and local artwork. I personally loved the upscale feel while still being accessible to families. I was able to enjoy the relaxing atmosphere without feeling out of place for having a 2 and 5 year old in tow. The ceiling of the lobby is adorned with the many faces that helped shape Philadelphia. There are plenty of secluded seating areas if you need a breather and local artwork lines the halls. Check out more information about the art collection here. The hotel holds 391 bold guest rooms and suites. 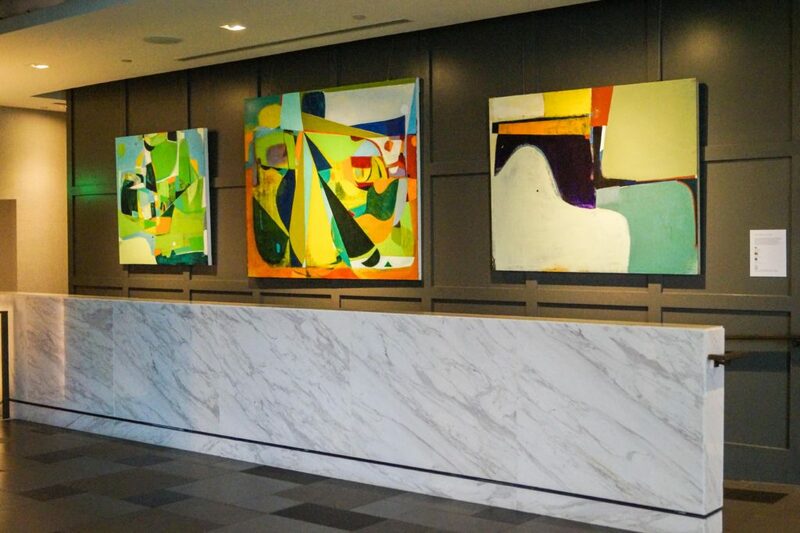 The modern, yet traditional, theme through the lobby and halls of The Logan continues in the rooms with locally curated artwork and nods to the city. We had a quiet courtyard view in a 400 square foot standard room. 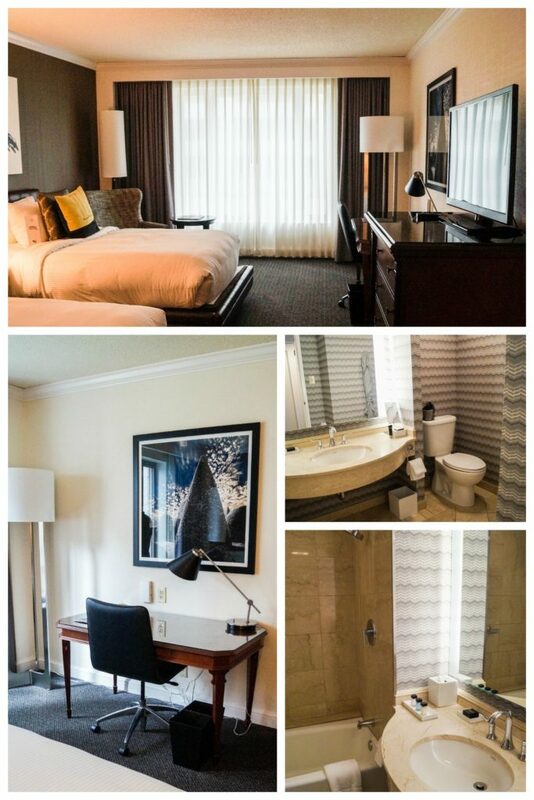 It was perfect for our family of four and particularly spacious compared to other city hotels we have visited. The bathroom itself was also a comfortable size, which is particularly helpful when trying to give the kids a bath or in the mornings when we are all trying to get ready. In-room amenities include a single-serve Kuerig machine with coffee and tea, mini-beverage cooler, bluetooth radio clock with charging station for iPhone and Android, toiletries, hair dryer, iron and ironing board, same day laundry and dry cleaning service, WiFi, 42″ HDTVs with cable and HD channels, and a laptop-sized safe. The beds were quite comfortable and we all had no issue getting a great night’s sleep. As a note, there isn’t a microwave and the mini-refrigerator had a notice on the front that it was only to be used to keep beverages chilled and wasn’t safe for food/dairy. 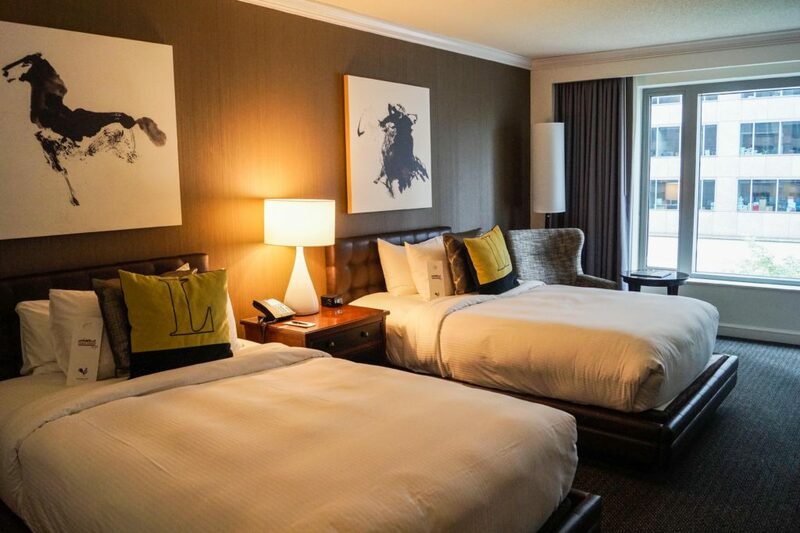 Other room options include Standard Rooms with a parkway view (of Logan Square), 600 sq foot Junior Suites, King Balcony suites, 700+ sq foot corner room Pennsbury Suites, 950 sq foot Bristol Suites, the 800 sq foot Canterbury Suite, 1,270 Commonwealth Suite, 1,400 sq foot James Logan Suite, and the impressive 2,500 sq foot Presidential Suite. I especially loved the personalized touches. The kids enjoyed their mini bathrobes that matched our larger Rocky-style robes. 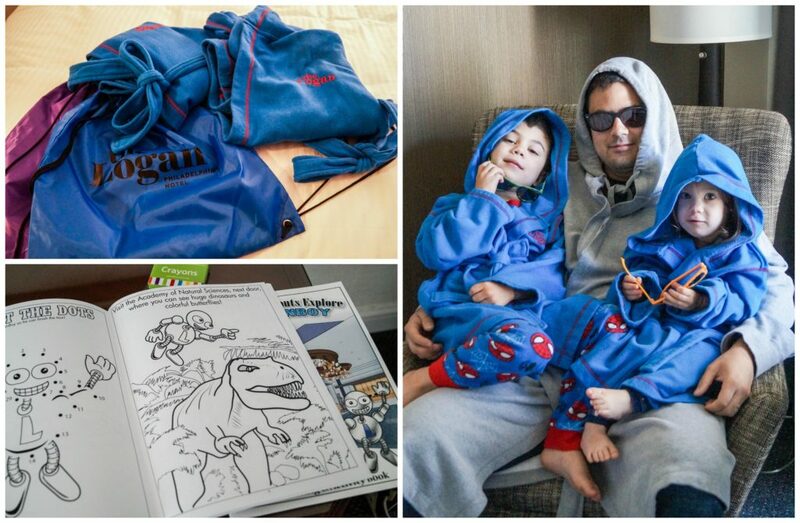 They were also each given a pack with sunglasses, crayons, and the hotel’s own Philadelphia-themed coloring books. Evan was able to recognize and color pages that featured the different sites he visited during the weekend like the Swann Fountain in Logan Square, the Academy of Natural Sciences, The Franklin Institute, the Rocky statue at the Art Museum, the Liberty Bell, and the carousel at the Please Touch Museum. 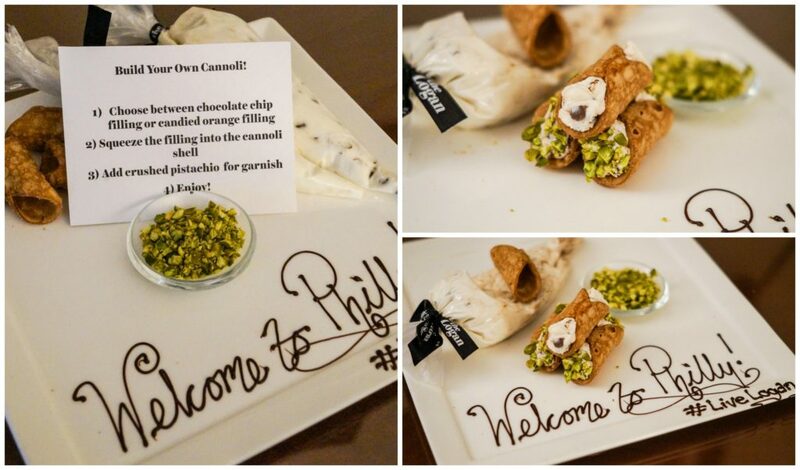 We were also surprised with this Build-Your-Own Cannoli platter. There were two filling options, Chocolate Chip and Candied Orange, along with a small bowl of chopped pistachios. The mini cannoli shell size was perfect for the kids. Claire developed a love for whipped cream during our trip to Maryland’s Eastern Shore and that love apparently includes ricotta cheese. The first thing Evan asked when I told him we were going to a hotel was if it had a pool. The saltwater indoor pool was perfect a place to unwind after a day touring Philadelphia. It has a beautiful deep blue color and the temperature was just right. Kickboards are also available for the kids to enjoy. 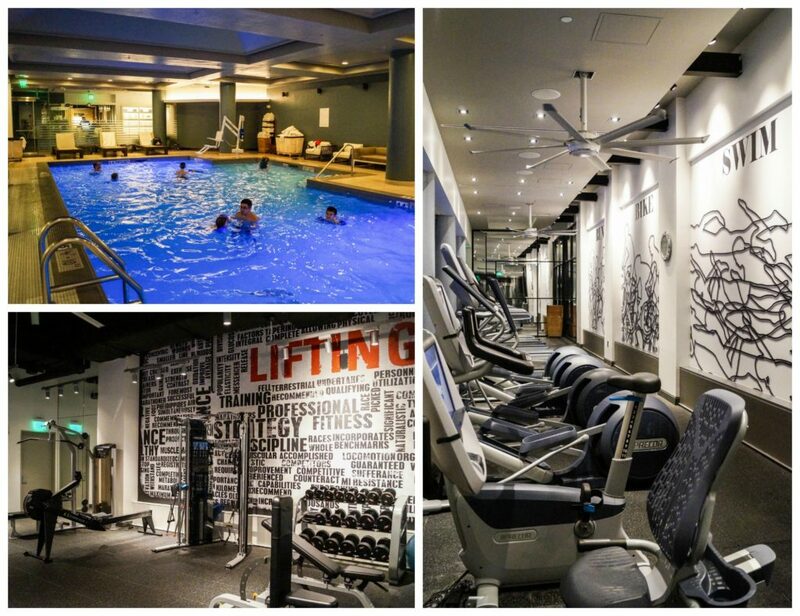 Adjacent to the pool is the well-equipped 24-hour fitness center with treadmills, ellipticals, bikes, a rowing machine, weight machines and free weights. This floor also houses the #1 Rated Spa and Wellness Center in Philadelphia with massages, skin care, body treatments, and nail services. 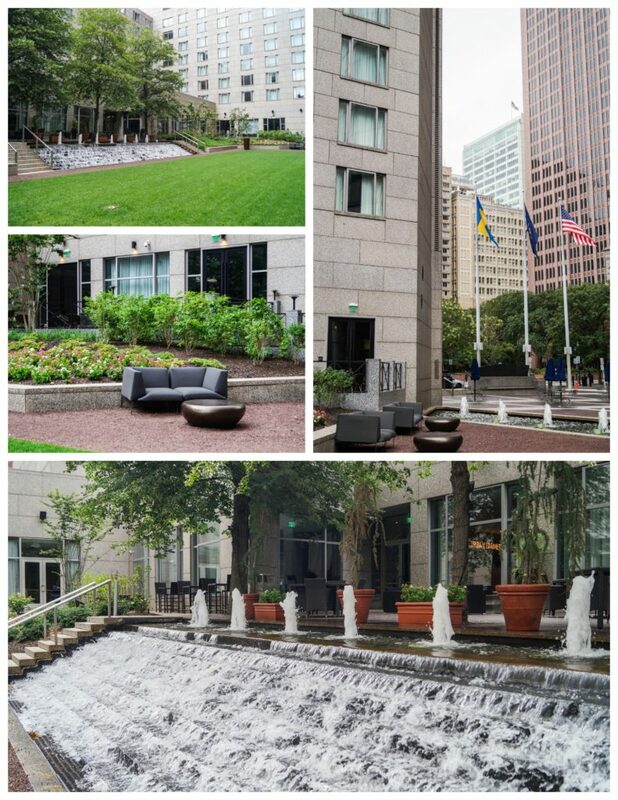 If you want some fresh air while still staying on the property, the hotel has a large courtyard with seating and a cascading fountain. This is a great spot to relax or enjoy a drink while the kids get to stretch their legs. 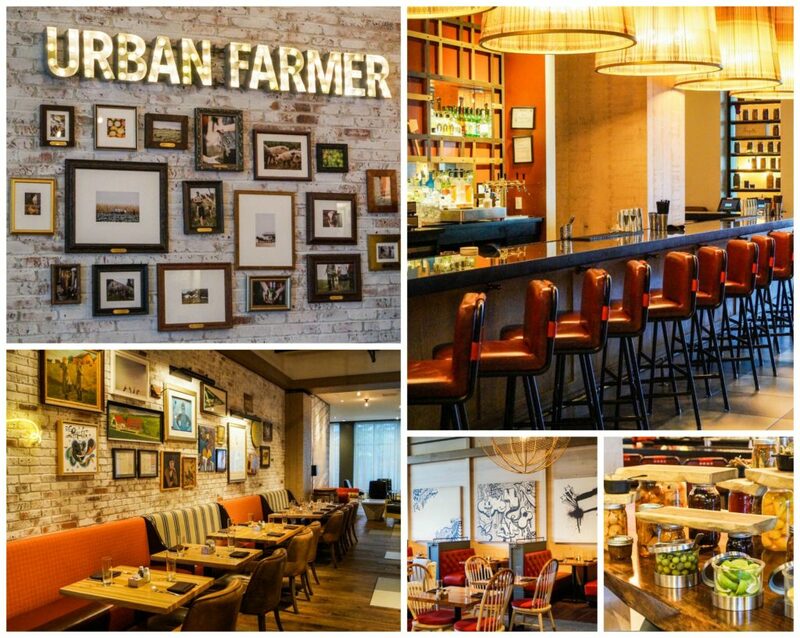 For dining, The Logan Hotel is home to Urban Farmer, Philadelphia’s Steakhouse. Designed by the Sage Restaurant Group, this stylish Philadelphia restaurant “translates the art, culture and classic elegance of the Northeast into artful cuisine prepared with fresh, local ingredients.” Open from 6:30 am to 10 pm (11 on weekends), menus are available for breakfast, weekend brunch, lunch, happy hour, and dinner. Don’t feel like dining-in? 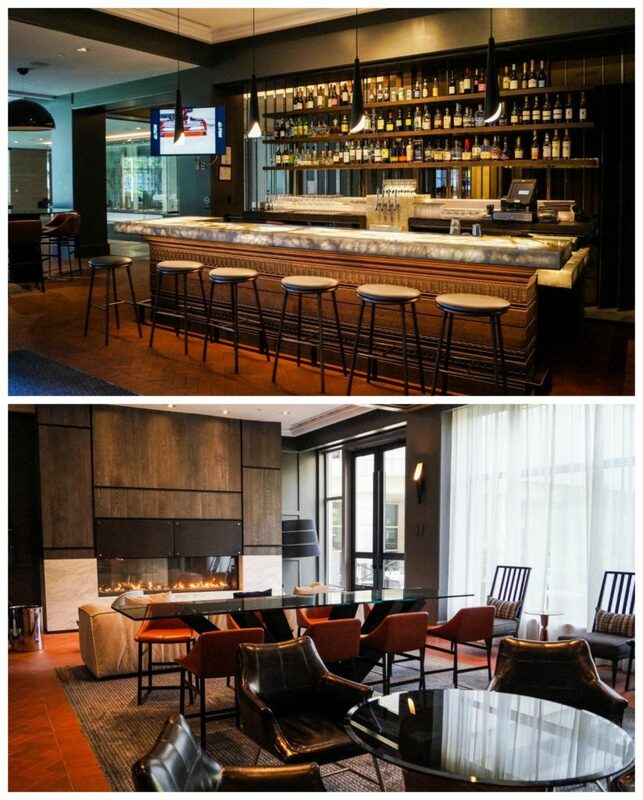 You can enjoy a selection of cocktails in their lounge or order room service with Urban TO GO. We stopped by for breakfast before heading out for our full day taking in the sites. We were brought a seasonal bowl of heirloom tomatoes with local blue cheese which was a welcome sight after my over-indulgence with sweets the day before. Some of Claire’s favorite foods are tomatoes and cheese, so she was particularly excited about this dish. From the menu, Chad picked the Eggs Benedict while I had the Vanilla Yogurt Panna Cotta (which Claire also ended up taking about half). The yogurt panna cotta was so light and paired perfectly with the granola and fresh berries. The kids split a Bagel and Evan had the Scrambled Eggs from the kids menu with Toast and a Crispy Potato. I loved the added touch of the seed packet placed on top of the check as we were leaving. We didn’t get to fully utilize the bars since we were traveling with small children, but each made separate small trips during the evenings. 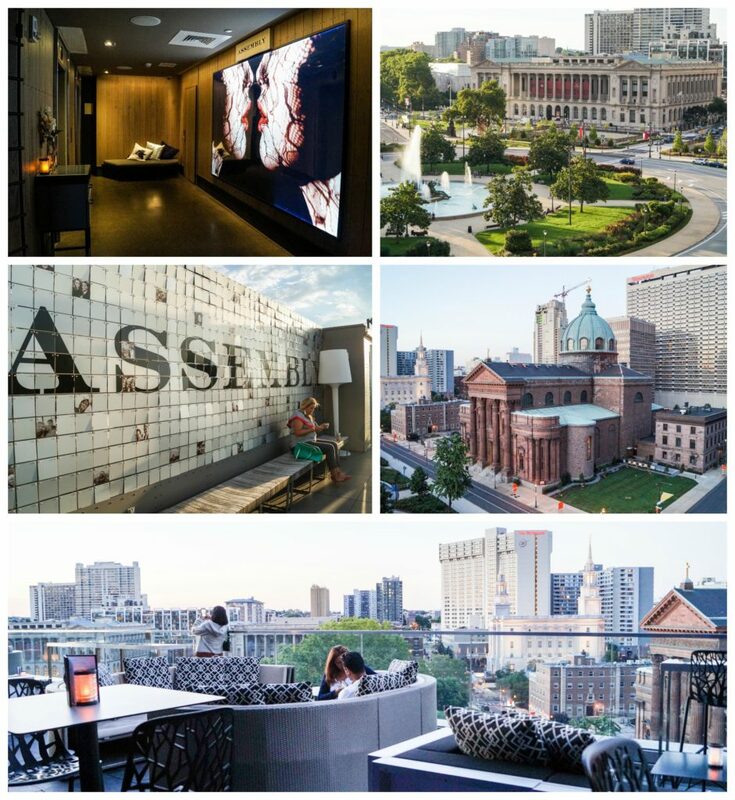 I explored Assembly, the rooftop bar on the 9th floor. 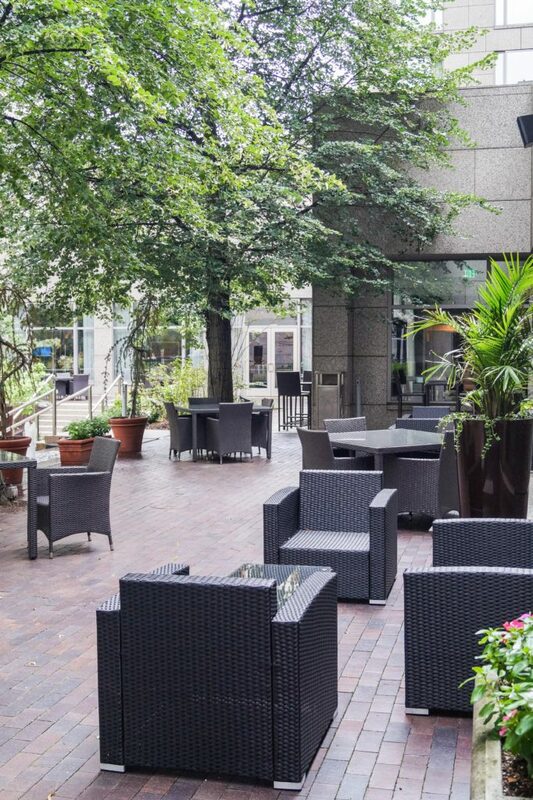 Here, you can enjoy cocktails in the open-air lounge area with a beautiful view of Logan Square and the surrounding area. 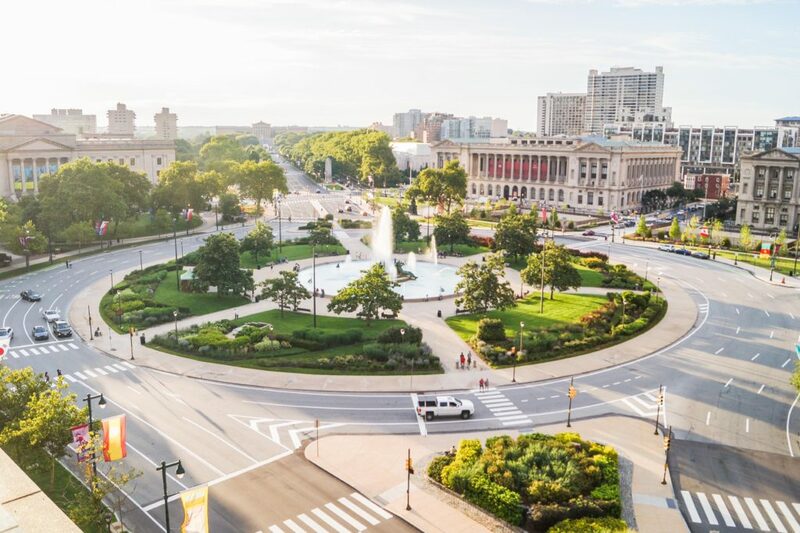 View of Logan Square from Assembly, along with the nearby Free Library of Philadelphia, Franklin Institute, and the Philadelphia Museum of Art in the background. Chad enjoyed a couple of beers in the Commons Lounge, located in the lobby. It was closed for a private event while I was exploring the grounds, but the other side of the fireplace reveals a quiet room with a billiards table and small library. We didn’t bring our dogs, but the hotel is also pet-friendly with a $50 enhancement fee. Upon request, your dog can feel right at home with homemade treats, bowl and bed, downtown pet guide, and dog-shaped waste bag dispenser. 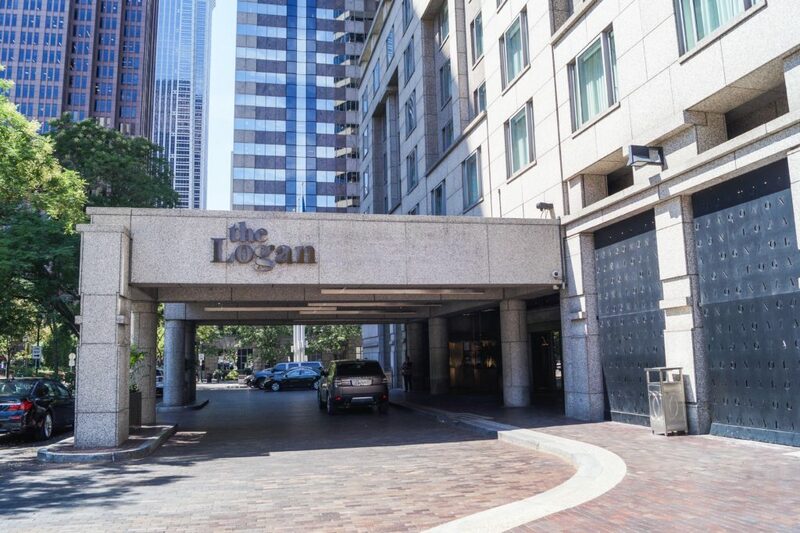 For those hosting events, The Logan holds 12,700 square feet of indoor and 6,300 square feet of outdoor event and meeting space. The staff was always friendly and there to help when requested. Check-in is at 4 pm with check-out at noon. We did request an early check-in and our room was available when we arrived at 10 am. If our room had not been ready, the front desk does offer to store luggage. They also had water bottles available upon request. Overall, we had an incredible weekend and I can’t wait to share the rest of our visit to Philadelphia. The Cannoli has been on my list of things to make for a while now. I even bought the molds a couple of years ago and had yet to put them to use. With the strong presence of the Cannoli in Philadelphia (and the many I tried over the weekend), I thought this would be the perfect time to feature them. 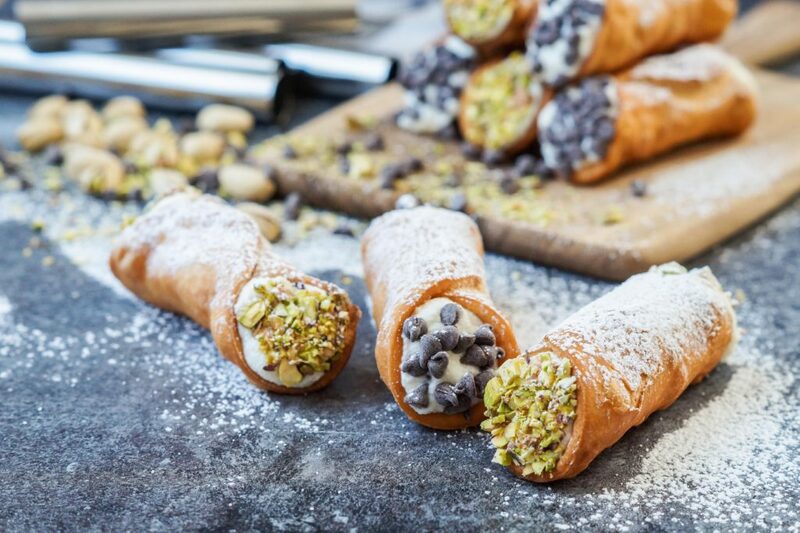 Cannoli originated in Sicily and were brought to Philadelphia by Sicilian immigrants. 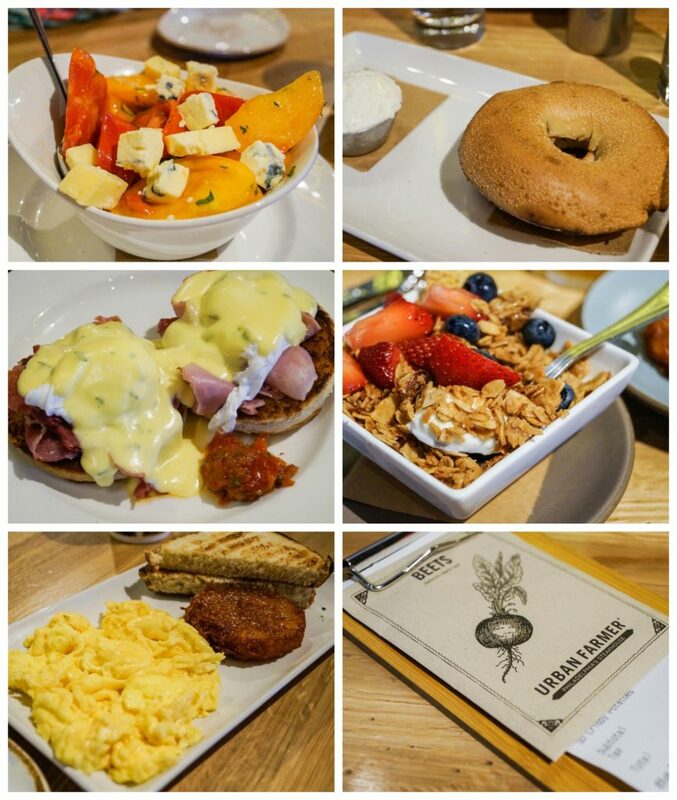 I tried my first in the city at Reading Terminal Market, then again at The Logan Hotel. These pastries are formed by wrapping thin circles of dough around a mold and frying until golden. They are then filled with sweetened ricotta. I included the recipe for my favorite filling, the traditional ricotta with some mini chocolate chips mixed in. I used a pasta machine to roll the shell dough into thin sheets, then used the top of a large cup (4 inch diameter) to cut out the circles. Each circle is wrapped around a mold and sealed with water or egg white to keep them from unraveling in the hot oil. They are fried just until golden (this happens quickly) and gently removed from the mold. I removed the shells by holding the mold steady with tongs and using a spoon to gently slide off the fried shell. Cover the uncooked rounds of dough during this process to keep them from drying out. 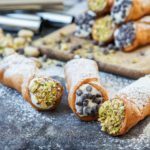 The cannoli shells can be made a day or so in advance and stored in an airtight container at room temperature. Do not fill them until right before serving. With time, the ricotta will soften the shells. I haven’t tried this product yet, but you can also make mini cannoli with this mold from Norpro. In the bowl of a stand mixer fitted with a paddle attachment or a large bowl, combine the flour, sugar, salt, and cinnamon. Mix in the red wine vinegar, lard, egg, and marsala until dough comes together. Line a baking sheet with paper towels and set aside. In a large saucepan, add oil until 2-3 inches deep. Place over medium heat to 375˚F. Divide the dough in half. Cover one half with a towel or plastic wrap and place the other on work surface. 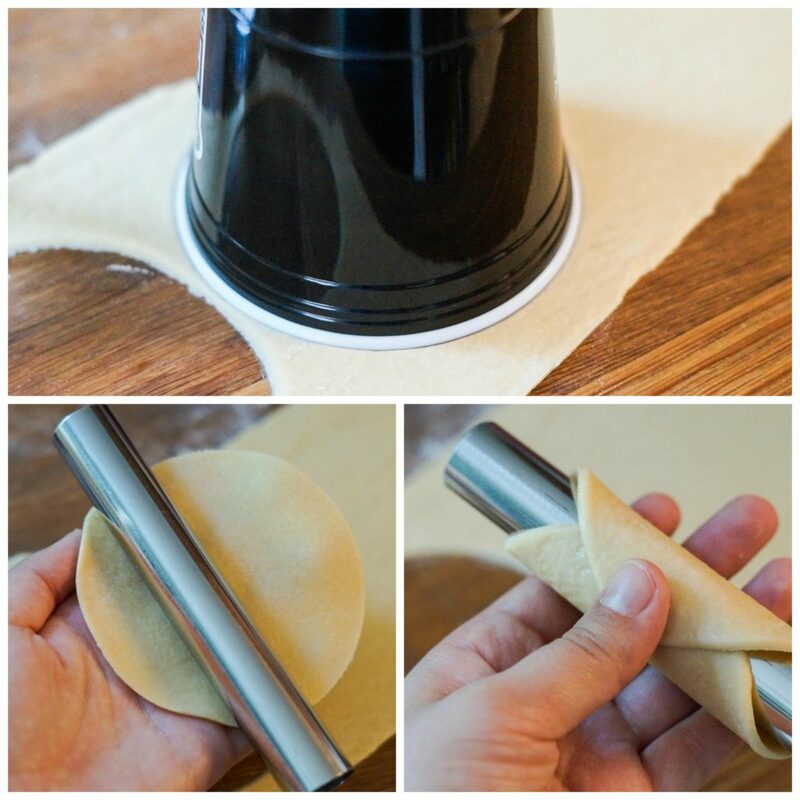 Use a pasta machine or rolling pin to roll the dough into a sheet about 1/8th inch thick. Use a 4 inch round cookie cutter or top of a glass/bowl to cut out rounds from the dough. Cover the formed rounds with a towel and repeat with remaining dough. Wrap one round around the cannoli mold, sealing the edges together with water and pinching to close. Repeat with remaining molds. Gently add the molds, 3-4 at a time, to the hot oil and fry until lightly golden. Carefully remove the molds from the fried dough using tongs and fry the shells for a few more seconds, setting the molds aside to cool. Remove the golden shells to the towel-lined baking sheet. Once the molds are cool enough to handle, repeat with remaining rounds of dough. Allow to cool. In a large bowl, mix together the ricotta, powdered sugar, and cinnamon. Fold in the chocolate chips. Cover and refrigerate until the cannoli shells are cooled and ready to be filled. Transfer the filling to a large piping bag or plastic bag with a 1/2 inch corner snipped off. Pipe the filling into each side of the cannoli shell to fill completely. Dip each side into the mini chocolate chips or chopped pistachios. Dust with powdered sugar and serve immediately. Omg these cannoli are beautiful! And it looks like you had a great time in PA. We have family there, though I’ve never been to Philly! Wow what amazing cannoli! Loved the recipe with stuffed ricotta and cinnamon combo! looks like a really nice hotel, I absolutely love the robes and really enjoy hotels with special little touches like that. It always makes you feel so much more welcome and adds an extra layer of enjoyment to a vacation. Thank you Tara. Makes us want to jump in the car and take the trip and stay in the same place you did. I enjoy reading about your travels and food. Thanks! It was our first time visiting Philadelphia. Such a great weekend. I love Philadelphia and The Logan Hotel looks like a dream hotel. Just beautiful. 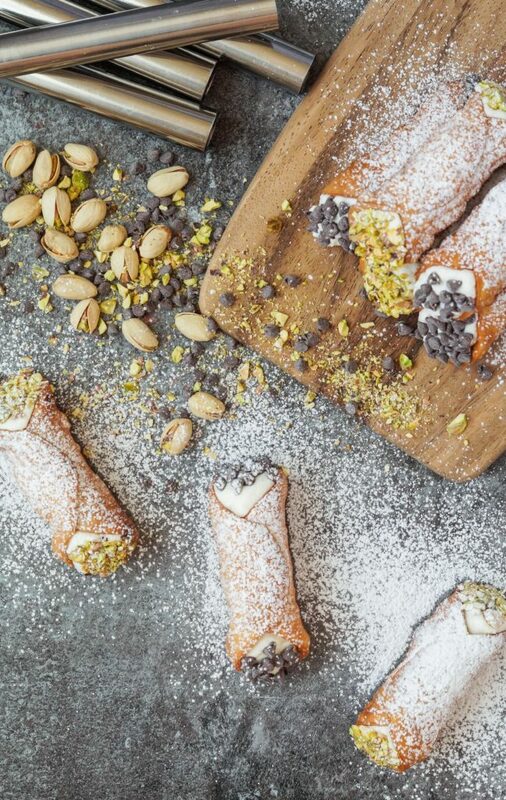 What a nice cannoli recipe too! Yum! Loved reading of your trip and it makes us want to duplicate the hotel and places you visited. You describe everything so vividly. Love to you and your beautiful family.